Shazman is the new ‘superhero kid on the block’ as Zachary Levi’s energetic, yet heartfelt performance nails his DC character for years to come! Finally, the DC Universe brings laughter while enhancing family values in the storyline. Wildly entertaining, with plenty of humor from start to finish, “Shazam!” is excellent for teens on up. Despite the second half featuring an overdrawn continuous battle between Shazman and villain Dr. Thaddeus Sivana, (Mark Strong), lasting for over an hour, the script has so many other side character amusements it doesn’t matter; the duo casually flies in and out of scenes in constant battle. That’s the beauty of Henry Gayden’s astounding script; light, casual, natural, quick-witted and humorous create a believable world mix of magic and superpowers. Philadelphia becomes the new Gotham/Metropolis, as Billy is placed in a foster family group home with guardians Victor and Rosa Vasquez (Cooper Andrews and Marta Milans). As foster parents, each has a warm, kind nature encouraging family bonding. Billy’s five new foster sisters and brothers are an eclectic group, fast-talking Freddy (Jack Dylan Grazer) surfaces as his self-appointed sidekick. Freddy’s character is wonderfully written as he uses a steel crutch to walk, thus bringing in the rarely seen physical disability, always great to see in any movies with kids. He’s also crucial to Shazam’s character development, in that he’s a superhero junkie—literally a walking encyclopedia, all of which is put to good use in the testing and documenting of Shazam’s powers. The experimental scenes as shown in the trailers and many new ones in the film are some of the most comical scenes in the film. Queen’s song, “Don’t Stop Me Now” blares during these hilarious trial and error sequences not only heightens the scenes, rather collectively, but they also form pure magic. Shazam’s powers are similar to Superman, therefore the ‘mad scientist villain’ Doctor Sivana is his archenemy similar to Lex Luthor. When we meet Dr. Sivana he has the power of six mighty gods at his disposal, he’s also a scientific genius. Though a villain, we see his tortured childhood as he’s bullied by a domineering father and tolerates a malicious older brother, they are the example of how not to behave in a family. Of course, by showing this flashback, we are slightly sympathetic, although we are more on the side of his redemption as a viable option. Most of us know Zachary Levi from the popular TV series “Chuck” (2007-2012) since that time Levi’s been nominated for a Tony award for the 2016 Broadway production of “She Loves Me,” In 2010, he voiced Flynn Rider in the animated film “Tangled,” singing a duet with Mandy Moore “I See the Flight,” the song won an Grammy. He also appeared in the films “Thor: The Dark World” and “Thor Ragnarok” as Fandral—although that character has been killed off. It’s widely known that director Sandberg and his team auditioned and viewed over 100 videos of people during their search.‘This guy feels perfect, he feels like a big kid, he has that enthusiasm and excitement,’ so right away, when I saw it, I knew,” Sandberg told The Wrap’s, Beatrice Verhoeven after viewing Levi’s video. 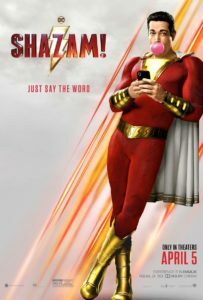 Levi’s Shazam carries the film in bestowing life lessons to kids and parents focusing on family, a poignant line near the end of the film says it all, “If a superhero can’t save his family, he’s not much of a hero.” He captures the joy of relishing a comic book through the eyes of a 13-year-old and bestows them to the cinema audience.